1.The first question referred back to discussions from around 2007 during the standardization process of OWL 2: Several rather distinct features were discussed for OWL 2 that didn’t make it into the standard; do you (still) want any or all of them, if you ever did? 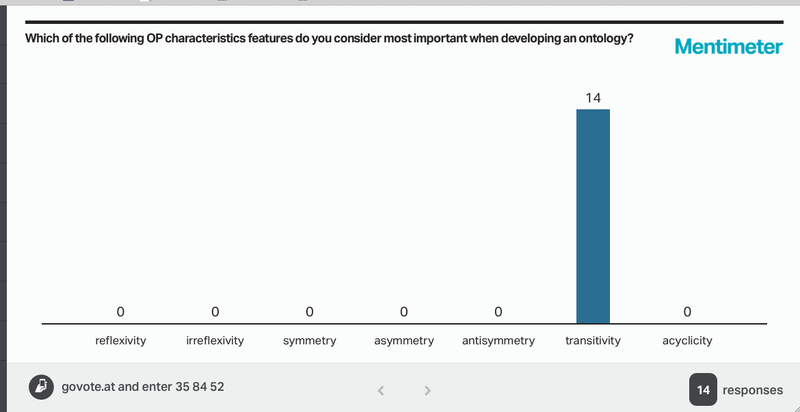 The results, below, show some preference for constraints among data properties, and overall a mild preference to at least have some of them, rather than none. 2. 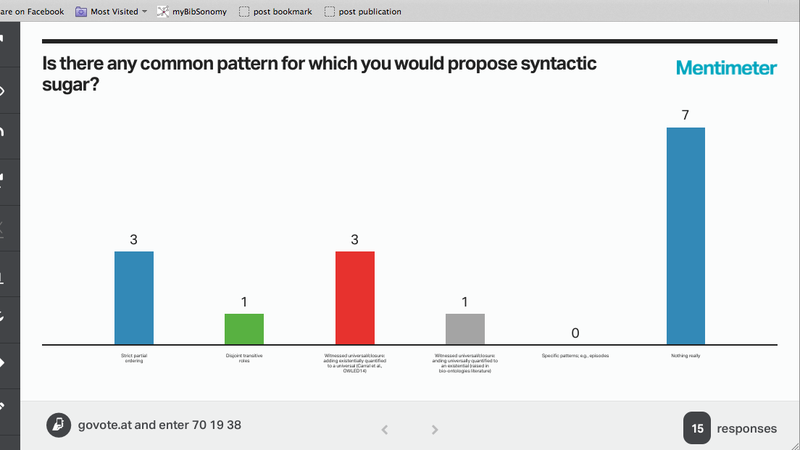 Is there any common pattern for which you would propose syntactic sugar? The results, below, are a bit divided. Carral et al.’s paper presented the day before seems to have done some good convincing, given the three votes, and the strict partial ordering, i.e., a pattern for parthood also received some votes, but about half of the respondents weren’t particularly interested in such things. 3. Ignoring practicalities on (in)feasibility, which of the following set of features would you like to see OWL to be extended with most? The results show that some temporal extension is the clear winner, which practically isn’t going to be easy to do, unfortunately, because even minor temporal extensions cause dramatic jumps in complexity. Other suggestions for extensions made during the discussion were more on data properties (again) and a way to deal with measurement units. 4. 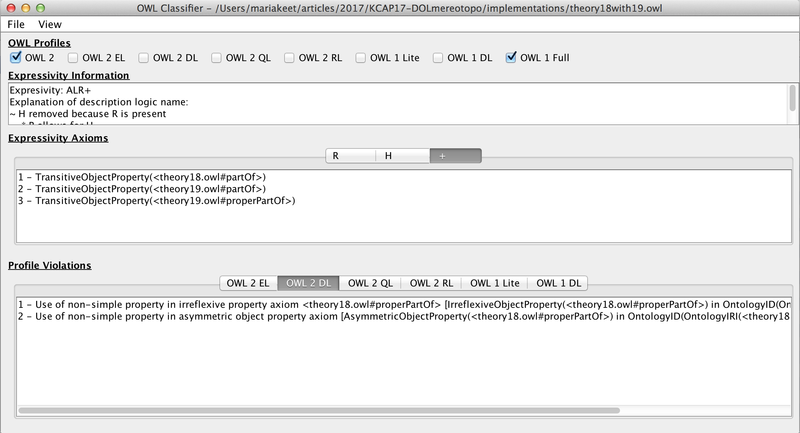 Which paradigm do you prefer in order to model / modify your ontologies in an ODE? Results again in the figure below. The interesting aspect is, perhaps, that there was no one who had no preference, and no one preferred a diagram-based tool. 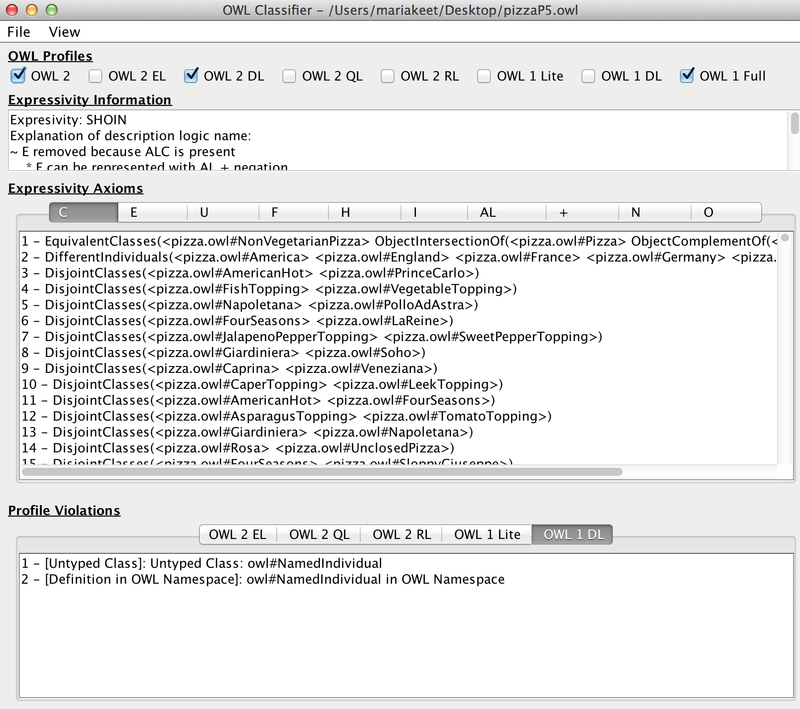 Mostly, it depends on the task, then some tool that caters for collaborative ontology development. 5. There are four standardised optional syntaxes in OWL 2. 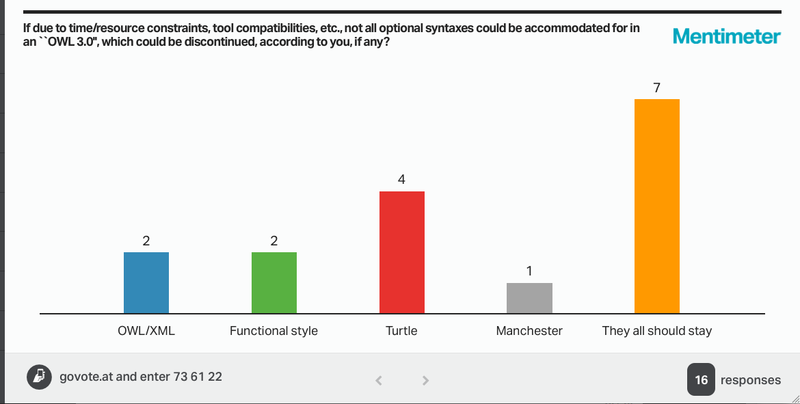 If due to time/resource constraints, tool compatibilities, etc., not all optional syntaxes could be accommodated for in an “OWL 3.0”, which could be discontinued, according to you, if any? The latter option, that they all should stay, was selected most among the participants, though not by a majority of voters, and I’m sure it would have ended up differently with more participants (based on discussions afterward). Note: by now, the voting was shown ‘live’ as the responses came in cf. the earlier hide-and-show. 6. Turning around the question phrasing: Which feature do you like less? 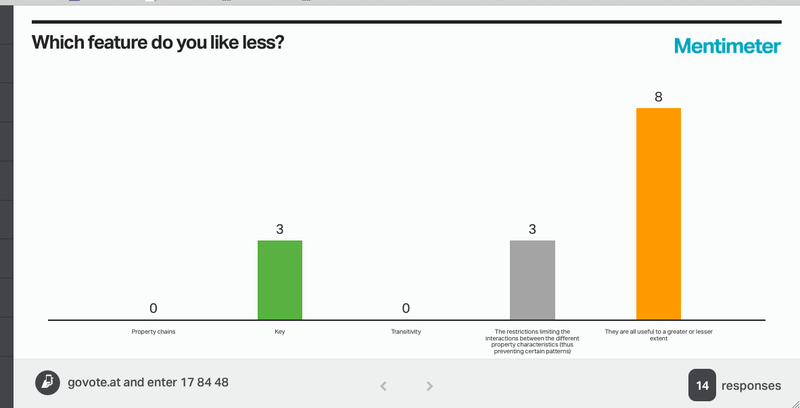 Options B and D generated a lively debate, but the results show clearly that the participants who voted wanted to keep them all. 7. 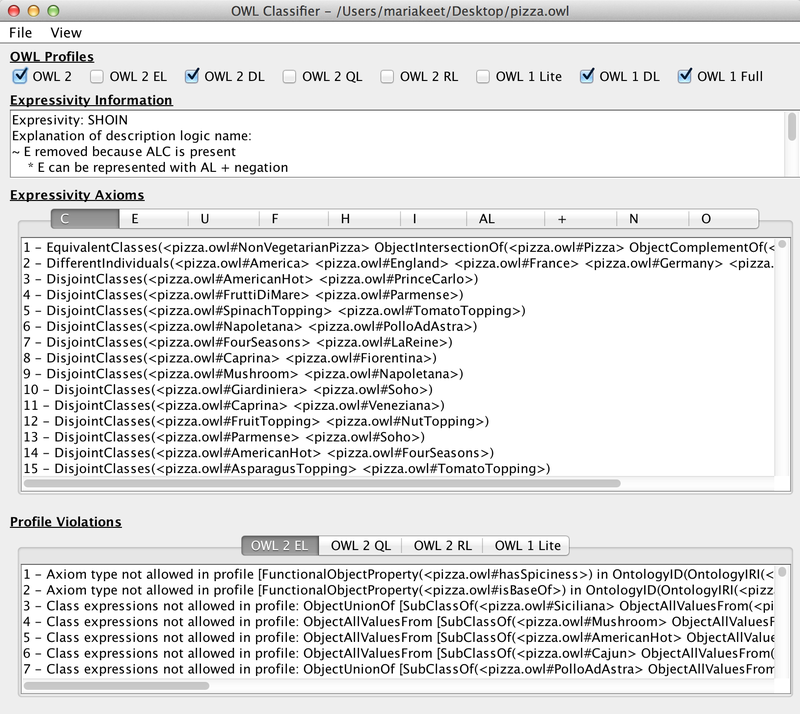 Which of the following OP characteristics features do you consider most important when developing an ontology? This last question appeared a no-brainer among the choices, with a unanimous transitivity above all. It was raised whether functional ought to have been included, which we intentionally had not done, for it’s a different kind of constraint (cardinality/multiplicity) than the properties of properties. The results most likely would have looked quite different if we did. 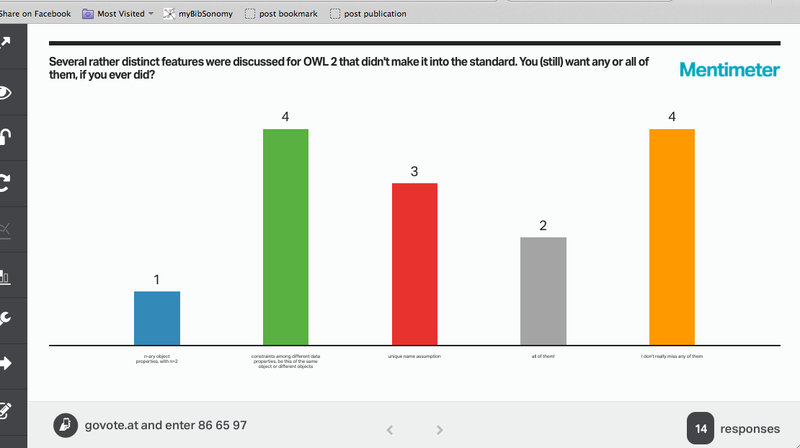 The results were supposed to be on the OWLED community page, but I have from reliable source (the general chair of OWLED14, Bijan Parsia) that the software doesn’t seem to be very friendly and feature rich, hence a quick post here. You can read Bijan’s live blogging of the presentations at OWLED there as well. The proceedings of the workshop are online as CEUR-WS vol. 1265.